The period covered by Arts:Search is 1917-1920. Available now. Edited by the art critic Frank Rutter (1876-1937) and the painters Charles Ginner (1878-1952) and Harold Gilman (1876-1919). They had intended to launch the magazine in the autumn of 1914 but publication was delayed by the outbreak of war later that year. It eventually made its appearance in July 1917 and ceased with the Spring 1920 issue. 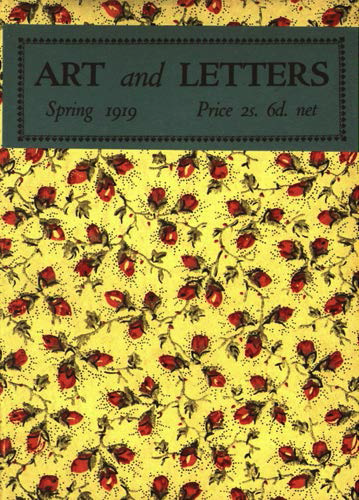 Art and Letters was a quarterly survey of the avant-garde in British art and literature. In addition to Rutter, Ginner and Gilman, contributors included Herbert Read, Osbert, Sacheverell and Edith Sitwell, T.S. Eliot, Ezra Pound, Wyndham Lewis, A.E. Housman, Isaac Rosenberg, Ronald Firbank, Katherine Mansfield, Aldus Huxley. Artists whose work is illustrated included E. McKnight Kauffer, Gaudier-Breszka, Paul Nash, Walter Sickert, Nina Hamnett, Jacob Kramer, Edward Wadsworth, John Nash, and Jacob Epstein.